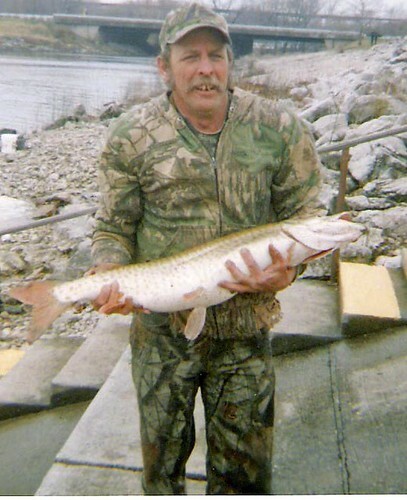 Chef Todd of Peoria poses with a muskie caught in the Lake Shelbyville spillway in the winter of 2006. To see video of fishing for muskie at the Lake Shelbyville spillway visit prairiestateoutdoors.com or pjstar.com. To check on discharge rates at the Lake Shelbyville dam, visit http://mvs-wc.mvs.usace.army.mil/trans/gages.html or call (217) 774-2020. Futile quests are nothing new to Mike Cooper. One weekend last summer he drove 1,100 miles one-way to Amarillo, Texas for the sole purpose of trying to eat a 72-ounce top sirloin steak. That he failed in his quest at The Big Texan Steak Ranch didn’t matter to Cooper, a heating and cooling worker from Washington. “Nah, it was still fun,” he said. Based on that, Cooper is well-suited for muskie fishing and well-prepared for a fishless excursion to the Lake Shelbyville spillway last week. But Cooper and most other anglers might not be prepared for the normal reality of the spillway, the most muskie-filled stretch of water in Illinois. At times Shelbyville’s tailwaters are someplace you can expect to catch a muskie, normally the fish of 10,000 casts. Muskie have been stocked in Lake Shelbyville for years and many have passed through the dam into the Kaskaskia River, where they survive. Actually, thrive is probably a better word. Consider that Shelbyville’s spillway has produced the state record, a 38-pound, 8-ounce whopper caught by Matt Carmean of Mattoon on April 20, 2002. Likely the best time to target muskie in the spillway is now. Starting Dec. 15, the U.S. Army Corps of Engineers began releasing water to draw down Lake Shelbyville to its winter pool level. As you can tell from the flocks of seagulls overhead, there’s an abundance of baitfish below the dam. The current and fresh water flowing into the Kaskaskia also lures muskie upstream until they reach the dam and form a toothy school. Still, nothing is guaranteed. Clanin, Cooper, Chef Todd, Randy Kakara of Streator and I (pictured at right sleeping off a huge lunch) were among 12 anglers gathered below the dam last Wednesday. Nobody caught a fish despite seeing several toothy rascals rise from the water like porpoises or slash at bait fish. Days earlier on Dec. 15 for the start of the drawdown, multiple catches were the order of the day. Chicago anglers reported eight muskie, locals hooked at least another seven on spinning rods and light tackle and Ryan Jozwiak of Dalton City caught nine on muskie gear. Those unheard-of muskie numbers draw anglers from farther away than Chicago or Peoria (a 2.5-hour drive from the spillway). “Last year when we were here there were guys from Kansas City and Omaha, Nebraska,” Chef Todd said. “Yeah, this is such a secret place,” Clanin agreed. While the secret is out, the fishing remains very good and very accessible. All an angler has to do is drive through Shelbyville, pull into the parking lot and walk down a few hundred yards of paved ground. Part of the spillway was formed into ledges and there are even benches, though they are typically underwater during the drawdown. But the ledges provide ample room for anglers to stand on while fishing — or to nap on after devouring venison chili, smoked chicken wings, salmon pate and shrimp cocktail. Nearby, Cooper nodded. He had taken an unpaid day off from work and had not caught a fish. Yet he was satisfied enough to ponder a return trip and to tell stories of his other summer trip, which involved hauling home 700 pounds of blueberries from Michigan. And at the Lake Shelbyville spillway, catching such a monster would probably be easier than eating a 72-ounce steak. EDITOR'S NOTE: This story was published Dec. 23, 2007 in the Peoria Journal Star.